Something old is new again for media outlets as email newsletters are making a comeback, the subject of a Saturday afternoon panel at the International Symposium on Online Journalism (ISOJ). The panel — NEWSLETTERS: How email, an almost 50-year-old technology, has become the next big thing for news organizations — will be chaired by Sara Fischer, a media reporter for Axios, which produces a number of newsletters readers can subscribe to. Fischer, who has a media history that includes stints at Politico, CNN, The New York Times and the Washington Post, will also be giving a presentation on the subject. Her newsletter at Axios focuses on media trends. Email newsletters have been touted as a tool to help improve engagement, revenue and audience growth. Tips for non-profit organizations outlined in a recent Medium article include being able to control the platform (unlike social media), and asking readers for contributions via emails has proven to be effective. Elisabeth Goodridge, editorial director of newsletters and messaging at The New York Times, will be joining Fischer on the panel. The Times has more than 50 editorial newsletters, which Goodridge oversees the optimization of as well as the development of new products. Rounding out the panel are: Mónica Guzmán, co-founder and director of The Evergrey; Dheerja Kaur, head of product and design at theSkimm; and Fernando Rodrigues, founder and editor of Drive Premium/Poder360 in Brazil. Guzmán, who was recently named one of Seattle’s top 50 influential women by SeattleMet magazine, has worked for both the Seattle Post-Intelligencer and The Seattle Times, in addition to writing columns for a number of news outlets. At the Evergrey, newsletters about news and events in the northwestern part of the city are emailed every weekday morning for free. But for $60 a month, a subscriber gets the newsletter plus discounts for events and merchandise. Kaur joined theSkimm after a stint at ESPN as an engineering and product leader. TheSkimm is known for its concise and newsy newsletters — targeting female millenials — that have a 30 percent open rate. Recode reported in March that theSkimm will be looking at creating more subscription revenue opportunities — in addition to its podcasts, videos and app — after raising $12 million in venture funding. Based in the Brazilian capital of Brasília, Rodrigues is responsible for the daily newsletter Drive Premium and the news outlet Poder360. A former foreign correspondent and Nieman Fellow, Rodrigues also helped create Abraji, or the Brazilian Association of Investigative Journalism. 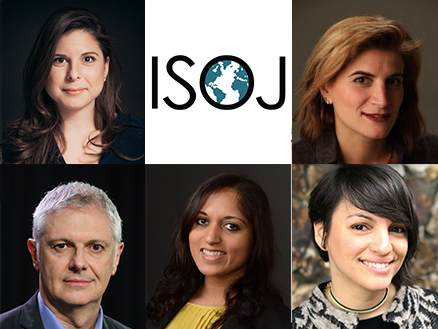 Registration for the 19th annual ISOJ is closed, but the April 13-14 conference will be live-streamed on YouTube and Isoj.org, including a channel with simultaneous translation to Spanish. For updates during the conference, follow ISOJ on Twitter at @ISOJ2018 or with #ISOJ2018. News will also be available on Facebook and Snapchat. ISOJ takes place at the Blanton Museum of Art on the campus of the University of Texas at Austin, and it features more than 70 media executives, professionals and academics from 41 countries.